Frances Lenore Myers is mtDNA haplogroup H7, "Helena"
In honor of my mother's birthday (yesterday), I am sharing some genealogy news about our mother line. H is associated with northern Europe and is the most common haplogroup in Europe. It is also referred to as "Helena." The mtDNA test tracks the mitochondrial markers in a woman's DNA. This is the "umbilical" line, DNA which has been passed down identically in the mitochondria of each cell from mother, to daughter, to granddaughter, and on, in an unbroken line, for thousands of years! When a mutation occurs in the mitochondrial DNA, which it does naturally, it is passed on to the next generation, creating a living record that tags those people carrying that DNA from then on. Scientists use this change in DNA, called a "marker," as a way of tracking where people lived at various times in history. All people with the same markers are categorized in groups called haplogroups. Of the 4 great-grandparents that we have in common, Gates/La Salle, Myers/Gorton, we know that the Goetz's came from Germany and La Salle we think was from Austria/Alsace Lorraine. The Myers/Maiers line was also probably from Germany. 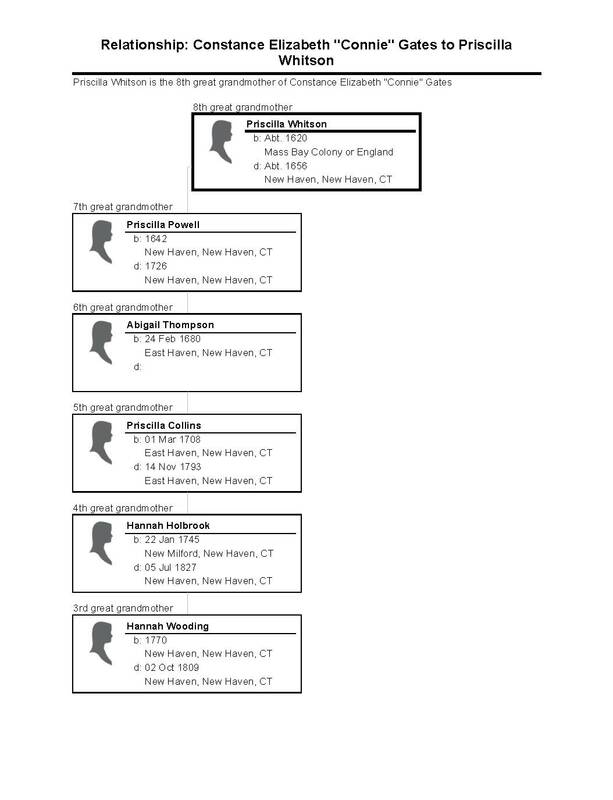 Now, with this test, we learn that the fourth line, Nana/Grandmother's maternal line, although recently from Ohio, and before that, from the New Haven, CT, colony, was originally from northern Europe. 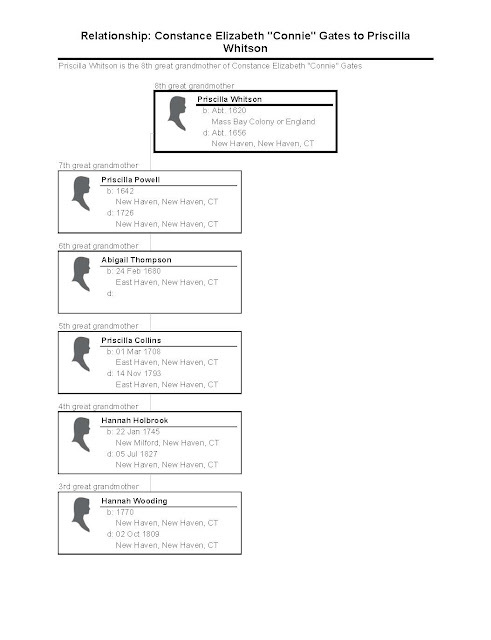 We could have guessed this since Nana/Grandmother's maternal great-grandmother, Emaline Hotchkiss, and Emaline's maternal ancestors, (the furthest back is Priscilla WHITSON) were all from the New Haven Colony in CT, whose settlers in 1638 were English. The New Haven Colony was formed in 1638 by a group of Puritans who wanted a STRICTER religious governance than existed in Massachusetts Bay Colony! Priscilla Whitson either came from England or was already in Mass. Bay Colony when the New Haven colony formed. Their theocracy in New Haven, a government based entirely on religion, only lasted one generation. In 1664, they joined with the Connecticut Colony which was secularily-based and much more tolerant of other religions. What is interesting is that this maternal line, which has been reproducing for 40,000 years or so, is in danger (in our family) of dying out. Since it is only passed from mother to daughter, only the daughters of Nana/Grandmother's daughters carry it. That would be Connie's and Fran's daughters. We know who we are! Connie and Fran's 4 daughters have produced 5 daughters (and 4 sons) born since 1966, and none of these daughters have had any daughters of their own, only sons. True, there is still time and women are having children later in life these days, but it's looking like the Gates mother line may not survive in our family. Of course our entire H line will not die out. If any of the sisters of any of our ancestors had daughters (like Mary Gorton's sister, Ella; Frances Lucinda Roberts' sisters, Mary Ann, Emma and Ellen; or Emaline Hotchkiss' 5 sisters...), then they would also carry the same H line down through their daughters. So think on those things dear Gates cousins. 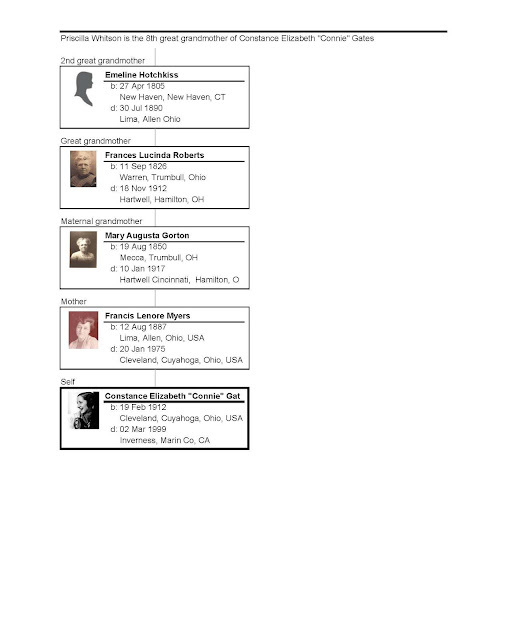 Perhaps when Sharon goes to the LDS library this week she may find more on the origins of Priscilla Whitson, the furthest back we go on the maternal line. Priscilla Whitson was born about 1616, married Thomas Powell in 1637 and came to the New Haven, CT, Colony in 1638 when it was formed. But where was she from? And for the Gates males who might be feeling left out, why don't we do a Y DNA test (cost is about $240), and we could all see where the Goetz line has traveled. Not only would we find out where our distant Goetz men originated, but we might find some other Gates relatives who match our DNA who we didn't suspect existed. All we need is one male, who carries the Gates name, to test. The oldest one is usually the best one to test, since younger men may have already had a mutation, but younger ones will do. We could even chip in if the cost seemed high. 15 of us at $15 each would do it. Do we know any Gates men who might be interested in spitting in a vial to find out something about our ancestry? I have discovered my Davis paternal line by having my brother take the test so would love to give advice. For those of you who want to read more, here's some info on the H haplogroup of Nana/Grandmother's maternal line from the 23 and Me website. Will let you know if I find any significant matches to my test. Maybe we have a H7 cousin out there? Maternal Haplogroup:H7. H7 is a subgroup of H.
The Mother of all Mothers (the MoM), our common maternal ancestor, lived in Africa about 175,000 years ago. Chart below is Locations of haplogroup H circa 500 years ago, before the era of intercontinental travel. H originated in the Near East and then expanded after the peak of the Ice Age into Europe, where it is the most prevalent haplogroup today. It is present in about half of the Scandinavian population and is also common along the continent's Atlantic coast. Highlight: Mitochondrial DNA extracted from the remains of St. Luke belonged to haplogroup H.
Haplogroup H dominates in Europe, reaching peak concentrations along the Atlantic coast. It is also common in many parts of the Near East and Caucusus Mountains, where the haplogroup can reach levels of 50% in some populations. H originated about 40,000 years ago in the Near East, where favorable climate conditions allowed it to flourish. About 10,000 years later it spread westward all the way to the Atlantic coast and east into central Asia as far as the Altay Mountains. About 21,000 years ago an intensification of Ice Age conditions blanketed much of Eurasia with mile-thick glaciers and squeezed people into a handful of ice-free refuges in Iberia, Italy, the Balkans and the Caucasus. Several branches of haplogroup H arose during that time, and after the glaciers began receding about 15,000 years ago most of them played a prominent role in the repopulation of the continent. H1 and H3 expanded dramatically from the Iberian Peninsula, along the Atlantic coast and into central and northern Europe. 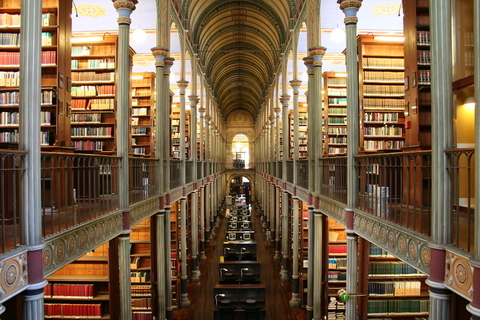 Other branches, such as H5a and H13a1, expanded from the Near East into southern Europe. After a 1,000-year return to Ice Age conditions about 12,000 years ago, yet another migration carried haplogroup H4 from the Near East northward into Russia and eastern Europe. Haplogroup H achieved an even wider distribution later one with the spread of agriculture and the rise of organized military campaigns. It is now found throughout Europe and at lower levels in Asia, reaching as far south as Arabia and eastward to the western fringes of Siberia. Royal LinesBecause it is so common in the general European population, haplogroup H also appears quite frequently in the continent's royal houses. Marie Antoinette, an Austrian Hapsburg who married into the French royal family, inherited the haplogroup from her maternal ancestors. So did Prince Philip, Duke of Edinburgh, whose recorded genealogy traces his female line to Bavaria.